The Prince of Wales and the Duchess of Cornwall's Christmas card has been unveiled to the public. It shows the couple at the wedding of Camilla's daughter, Laura, to Harry Lopes in May at St Cyriac's Church, Lacock, Wiltshire. The photograph was taken by Hugo Burnand, who also took the couple's wedding picture for their 2005 card. 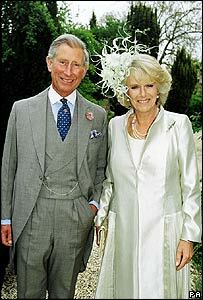 Camilla wears a Philip Treacy headdress and a Robinson Valentine coat, while Charles sports a grey morning coat. Last year, the prince and the duchess used a picture of themselves on their own wedding day.